By second grade, these words are more commonly referred to as wall words. Typically, they are prominently displayed (preferably at a child’s eye level) on the wall for a student to reference. A second grader should spell these words correctly. 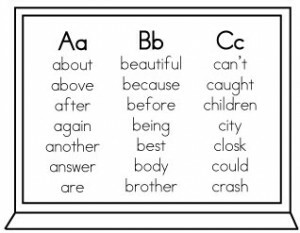 To assist a child in obtaining the correct spelling, these words are typically alphabetized and placed on a wall in the classroom. Many of the above words can also be found on a spelling demons list – a list of misspelled words. It is common for students to misspell phonetically irregular words and homophones. Many sight words are phonetically irregular, they must be taught as a whole word. A child will need to memorize how to spell these words and automatically recognize them. In addition, many sight words are homophones; words that sound the same but have different meanings and spellings, e.g. to, two, too, ate, eight. Many of the above second grade words can also be found on Dolch’s 220 instant word list and his 95 nouns list. Students are expected to reference the above list and spell the above words correctly. If your child is struggling with any of these second grade words, make a journal or create index cards and review these words with your child.